The championships won by the Grand Canyon University baseball and lacrosse teams Saturday got a lot of attention, and rightfully so. 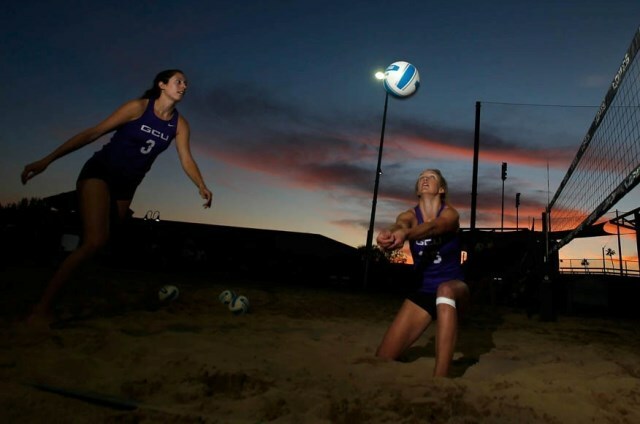 But the list of GCU successes in the 2015 spring sports season would not be complete without examining the footprint left behind by sand volleyball. Specifically, that means Mackenzie Phelps and Shannon Dugan, who teamed up to reach the semifinals of the American Volleyball Coaches Association’s Sand Volleyball National Championship in early May at Mobile, Ala. 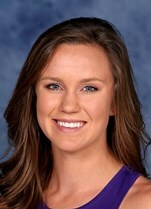 If you went to a GCU indoor women’s volleyball match last fall, you no doubt are familiar with Phelps and Dugan, two stars of the team that went 21-11. Dugan was especially unforgettable because of her name, which public-address announcer Paul Danuser turned into “Duuuuuugan!” every time she had a point-winning spike or block — and that was often. “People would come up behind me when I was walking back to my dorm and say, ‘Duuuuuugan.’ And I’d think, ‘Who said that?’ It’s kind of cool to see more students interact with the athletes and come to the games more,” she said. Unlike the GCU baseball and lacrosse teams this spring, Phelps and Dugan weren’t expected to earn national recognition in the sand. But like their GCU counterparts, they turned some heads with their play — in particular the team from Florida State. Yes, Florida State. As Phelps and Dugan upset the pairs from Long Beach State and Hawaii, they acquired a new cheering section. “We were hearing all this cheering and we said, ‘That can’t be just our parents,’ Phelps said. Or maybe it’s because they were the underdog in another way. Though Phelps is 5-foot-10 and Dugan is 5-11, it’s not uncommon for women taller than 6 feet to be jumping above the volleyball net. “Shannon and I are both very dynamic and very athletic, so even though we’re not very tall, we can still bounce a ball but we also can shoot a ball around the block,” Phelps said. “We’re really good with control. These two best friends, the only GCU representatives in the tournament, began their day by shocking a Long Beach pair that had throttled them just three weeks earlier. Next up was Hawaii, another pair that had beaten them earlier in the season. “Going into that match, we were just like, ‘We’ve exceeded everyone’s expectations here. We’ve exceeded our own expectations,’” Phelps said. “We knew we were All-Americans already. We just had no cares in the world. We were just going out there to play with each other and played like it was the last match of our season and really had fun. Phelps and Dugan lost their third match of the day, in the semifinals, to Betsi Metter and Sarah Sponcil of Loyola Marymount, who also had beaten them earlier in the season and, like them, are shorter and more athletic. “I think the exhaustion started getting to us physically, and we just didn’t pull it out mentally,” Phelps said. Phelps and Dugan both got their Colangelo College of Business bachelor’s degrees in April and have completed their indoor volleyball eligibility. But NCAA rules allow athletes an extra year in another sport — and sand volleyball is considered another sport. So they both will remain on campus for the 2015-16 school year while working toward their master’s, Phelps in accounting and Dugan in business administration. That means getting to enjoy another year of a friendship that began when Dugan transferred to GCU from Lynn University in Boca Raton, Fla., after the fall semester of her sophomore year. She said she loved Florida, but she renounced her scholarship mainly because she wanted to play sand volleyball and Lynn didn’t offer it. 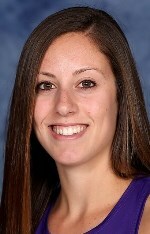 It helped that GCU was closer to her home in Gardnerville, Nev.
“It’s fun to play with your best friend,” Dugan said. “We can scream and yell at each other at practice, and at the end of the day we know we’re all good. They probably won’t be the underdogs next year, but that’s OK.
“I think it will be a really nice advantage for Shannon and me because we’ve already built that relationship, and sand volleyball is a lot about relationships on the court,” Phelps said. Don’t be surprised if Phelps and Dugan are once again on the list of spring sports accomplishments a year from now. After all, this is quite a duuuuuuo. Congratulations to both the champions who reached the semifinals of Sand Volleyball National Championship. Really great to hear the news.